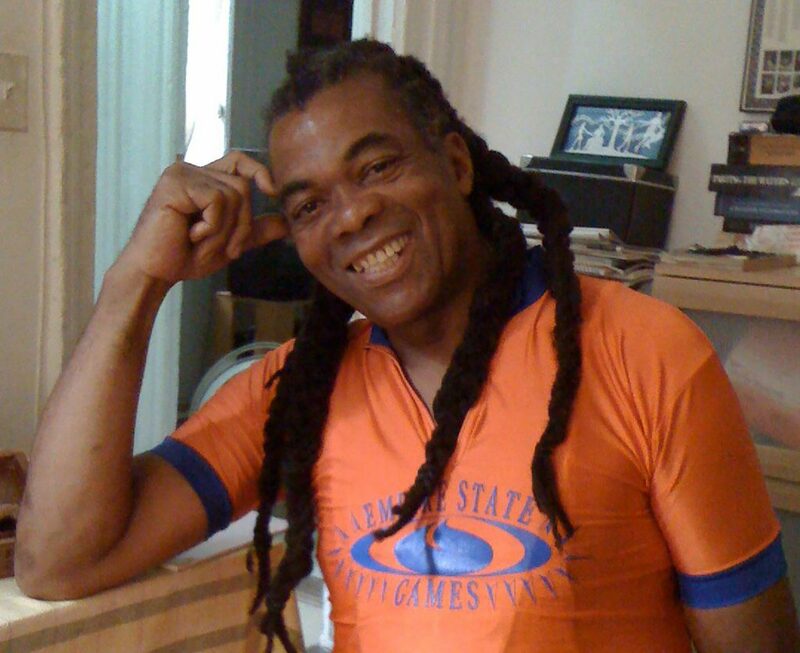 Mr. Montgomery, an NYC native, played supporting roles in movies and television and a large role in the NYC cycling community. As a SAG actor, Mr. Montgomery was cast in many movies and TV programs, including Oz, Law & Order, New York Undercover, 30 Rock, Blacklist, The Sorceror’s Apprentice, Captain America, and The Warriors. Mr. Montgomery often portrayed a bike messenger, and was something of a cult figure to local messengers. For over 40 years he raced his bicycle in New York City with long locks flying behind him. When he began his career in the 70’s, he was one of the few African-American cyclists in NYC. His first race was the Harlem Criterium, and it was there that he met coach and mentor, Jimmy Keo. Mr. Montgomery raced locally for Westchester Velo and later Toga/Gotham Bikes. He also traveled the country and the world on cycling teams, though his heart always remained in New York City. He was a figure to be reckoned with on the Gimbels training rides every weekend. Jimmy Keo first brought Mr. Montgomery to the Gimbels when he was a young man, but over the years, he became one of the elders of the ride. Mr. Montgomery was very vocal, always yelling, “Una linea!” (One line), on the rides, trying to keep the riders in a safe formation. “He was so instrumental in making people feel welcome, especially people who didn’t fit the power-profile, like women and people of color. And everybody loved him,” said one Gimbels rider. Mr. Montgomery called bike racing “high speed chess.” For over 20 years, he coached the New York City team at the Empire State Games, as well as the Toga/Gotham Bikes racing team. Throughout his career, he advocated for women’s cycling, and in the 90’s, he coached The Scorches, an all-women’s team. ‘Coaching was something he just did naturally,” said, Luis Vieira, Toga/Bike shop owner. “Out of all the people that you know in cycling, he’s done favors, he’s helped everybody and he never once asked for anything. He was unselfish. Always helping and promoting other people. Out of all the cyclists in New York, including pros, Bill was NYC cycling,” he added. Mr. Montgomery was an extremely entertaining bike race announcer. Over the years, he called many races, including The Harlem Criterium, The White Plains Criterium and The Tour of the Battenkill. Mr. Montgomery was family to Elite Couriers and The Central Park Dance Skate Circle, which is where he met the love of his life, Jennafer. He is survived by her, his two sons Bill Jr. and Dominick, by his daughter Phylicia, his two sisters Merle and Lisa, and his grandchildren: Christian, Josiah, Gia, Jayce, Wynter, Jason, and Penélope, as well as nieces, nephews and cousins. He is pre-deceased by his mother, Margaret and his brother Milton.